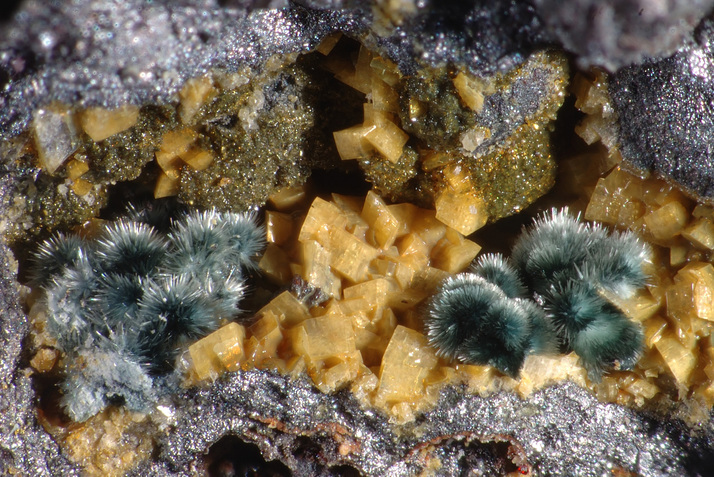 Parasymplesite: Mineral information, data and localities. Named by Tei-ichi Ito, Hideo Minato, and Kin-ichi Sakurai in 1954 from the Greek παρα = beyond for the polymorphic relationship to symplesite. The Fe2+ analogue of köttigite and erythrite. May be intergrown with symplesite. Köttigite 9 photos of Parasymplesite associated with Köttigite on mindat.org. Arseniosiderite 7 photos of Parasymplesite associated with Arseniosiderite on mindat.org. Scorodite 4 photos of Parasymplesite associated with Scorodite on mindat.org. Quartz 4 photos of Parasymplesite associated with Quartz on mindat.org. Gypsum 3 photos of Parasymplesite associated with Gypsum on mindat.org. Calcite 3 photos of Parasymplesite associated with Calcite on mindat.org. Dolomite 2 photos of Parasymplesite associated with Dolomite on mindat.org. Symplesite 2 photos of Parasymplesite associated with Symplesite on mindat.org. Stibarsen 2 photos of Parasymplesite associated with Stibarsen on mindat.org. Legrandite 2 photos of Parasymplesite associated with Legrandite on mindat.org. 20.9.10 Kolfanite Ca2Fe3+3O2(AsO4)3 · 2H2O Mon. 20.9.14 Liskeardite [(Al,Fe)32(AsO4)18(OH)42(H2O)22] · 52H2O Orth. 20.9.15 Mapimite Zn2Fe3+3(AsO4)3(OH)4 · 10H2O Mon. Tei-ichi Ito, Hideo Minato, and Kin-ichi Sakurai (1954): Parasymplesite, a New Mineral Polymorphous with Symplesite. Proceedings of the Japan Aademy: 30: 318-324. Sturman, B. Darko (1976): New Data for Koettigite and Parasymplesite.Canadian Mineralogist, 14: 437-441. Cesbron, F., Sichere, M. C. and Vachey, H. (1977): Propriétés crystallographiques et comportment thermique des termes de la série koettigite-parasymplésite. Bulletin de la Société française de Minéralogie et de Cristallographie, 100: 310-314. Yoshiasa, A., Miyano, Y., Isobe, H., Sugiyama, K., Arima, H., Nakatsuka, A., Momma, K., Miyawaki, R. (2016): Structural refinement of köttigite–parasymplesite solid solution: Unique cation site occupancy and chemical bonding with water molecules. Journal of Mineralogical and Petrological Sciences, 111, 363-369. Postl & Walter (1983) [zit. in R. Exel: Die Mineralien und Erzlagerstätten Österreichs (1993)]; Huber, S. & Huber, P. (1981): Die Mineralien der Antimonitlagerstätte Schlaining, Burgenland. Die Eisenblüte, Jahrg. 2 NF., Nr. 3, 18-22. G. Niedermayr, I. Praetzel: Mineralien Kärntens, 1995; MEIXNER, H. (1964): Neue Mineralfunde in den österreichischen Ostalpen XIX. Carinthia II, 154./74., 7-21.
ⓘ Roßeck District (Saurau; Saurauwald) ? Pierre et terre N°23/24 , premier semestre 1982, page 91. Kleinander, R. (2009): Die antimonerzführenden Gänge im Münstergrund bei St. Trudpert. Mineralien-Welt 20 (5), 42-50. Verein der Hegauer Mineralienfreunde (1983) Rezente Mineralbildungen in den Schlacken ehemaliger Erzverhüttung. 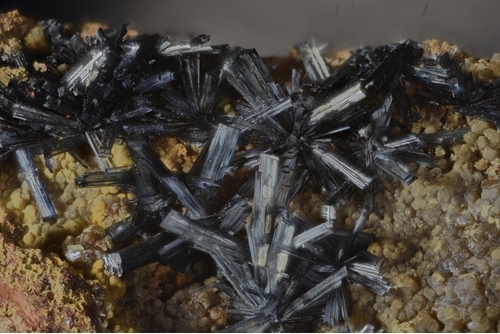 Mineralien-Magazin, 9/1983, 411-413.; Nieding, E. (1990) Rezente Mineralbildungen in Schlacken der Schmiedestollenhalde in Wittichen/Schwarzwald. Der Aufschluss, 41, 361-364. K. Walenta: "Die Mineralien des Schwarzwaldes", Weise (Munich), 1992; Brill, A.R. (2017): Die antimonerzführende Mineralisation des Holderpfadgebietes bei Sulzburg im Südschwarzwald. Aufschluss, 68 (1), 16-36. Der Aufschluss Vol.55, March/April 2004; SCHNORRER, G. (1995): Mineralogische Neuheiten von bekannten deutschen Fundorten. Lapis 20 (12), 43-48; 62. Guastoni, A., Demartin, F., Pezzotta, F. (2003): Considerazioni genetiche sull'arsenopirite e altri minerali di arsenico di filoni pneumatolitici nel granofiro di Cuasso al Monte (VA). Atti Soc. Ital. Sci. Nat., 144, n2, 247-263; Guastoni, A., Pezzotta,F., Demartin, F. (2004): Cuasso al Monte: recenti determinazioni su esemplari del MSNM. Riv. Mineral. Ital., 28, 4 (4-2004), 194-202. Campostrini, I., Martini, B., Salvetti, A., Dalla Fontana, G., Boscardin, M., Ambrino, P., Ciriotti, M.E. (2012): Stibioclaudetite dalle gallerie inferiori di Biò, Borgofranco d’Ivrea (Torino). Micro, 10, 142-144; Campostrini, I., Demartin, F., Martini, B., Salvetti, A., Dalla Fontana, G., Boscardin, M., Ambrino, P., Ciriotti, M.E. (2014): Villyaellenite dalle gallerie inferiori di Biò, Borgofranco d’Ivrea (Torino), Piemonte. GMT 2014 Giornate Mineralogiche di Tavagnasco, 6-8 giugno 2014. Plinius, 40, 170. Proc. Japan Acad. (1954) 30, 318-324; Satoshi Matsubara, Ritsuro Miyawaki, Masako Shigeoka, Hidemasa Tajima, Katsuichi Nishida and Yoshiteru Fujiwara (2009): Bendadaite and iron arsenate minerals from the Kiura mine, Oita Prefecture, Japan. 2009 Annual Meeting of Japan Association of Mineralogical Sciences, Abstracts Volume, Abs. R4-06, p. 100. Masayuki Ohnishi, Norimasa Shimobayashi, Shigetomo Kishi, Mitsuo Tanabe, Shoichi Kobayashi (2013) Talmessite from the Uriya deposit at the Kiura mining area, Oita Prefecture, Japan. Journal of Mineralogical and Petrological Sciences, 108, No. 2 (April), 116-120.; Enju, S., & Uehara, S. (2015). Yukonite and wallkilldellite–(Fe) from the Kiura mine, Oita Prefecture, Japan. Journal of Mineralogical and Petrological Sciences, 110(3), 150-155. A.R. Kampf : "Cobaltarthurite from the Bou Azzer district, Morocco", 5th International Conference "Mineralogy & Museums", Paris, Sept. 5-8th 2004, Bull. de Liaison de la Soc. Franç. de Minéralogie et Cristallographie, 2004, Vol 16, N°2. In the collection of Joy Desor. PXRD and EDS analyzed. Stalder, H. A., Wagner, A., Graeser, S. and Stuker, P. (1998): "Mineralienlexikon der Schweiz", Wepf (Basel), p. 297. 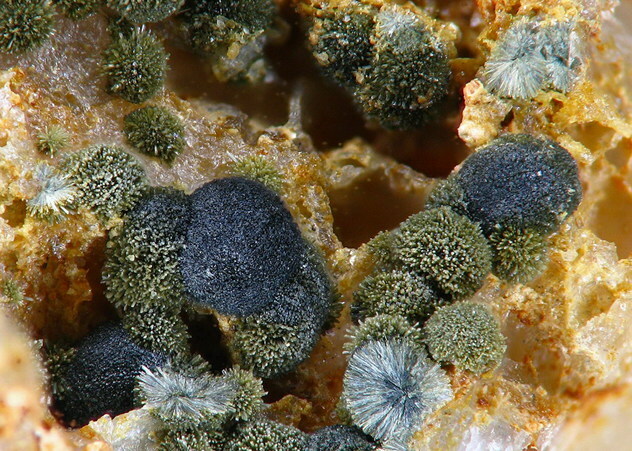 Paul De Bondt collection; Merry, M. & Weiß, S. (2017): Nickel- und Kobaltmineralien aus der St. Austell Consols Mine, Cornwall (GB). Lapis, 42 (1), 24-26; 39-40; 62 (in German).